Neighbourhood Wash is an abstract comic that uses sequential images of circles and triangles, which interact to illustrate gentrification. The comic is able to give the impression of gentrification by playing on the semiotic relationships between shapes and emotions. The soundtrack (composed by Jope Sound) influences the reader's concept of time within the comic by attempting to synchronise to visual anchors throughout the narrative. 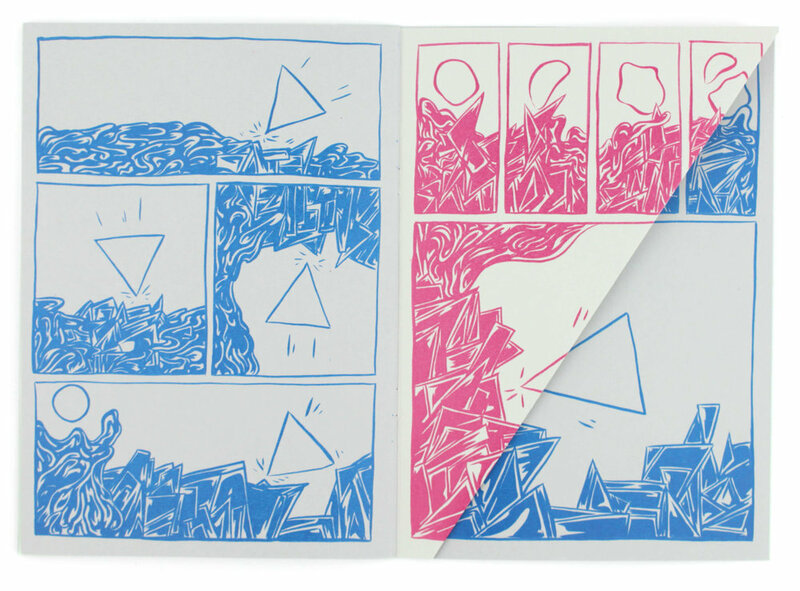 The comic is a one off publication produced by colour photocopying black ink original artwork. The cover is printed with lino cut relief. Neighbourhood Wash is the second of two outcomes from a series of research projects based around the theme of visualising sound. The research explored themes of; understanding the basic formulas for reading and designing sequential art, exploring the possible effects abstraction can have on graphic narrative theories and concluding psychological hypotheses about the intuitive connections between instrumental music and abstract visuals.